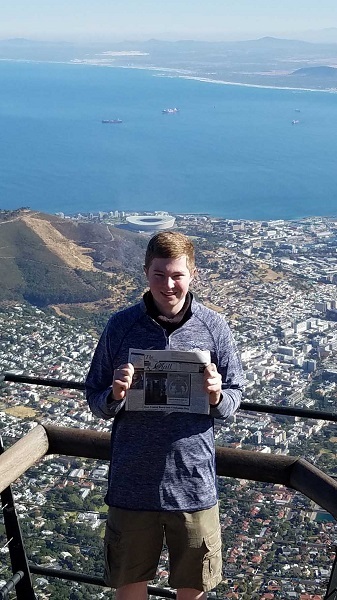 J.C. Campbell of Bald Bluff Township in northern Henderson County, who is currently serving as the Illinois Association FFA State President, took "The Quill" along on one of his official journeys to South Africa. During his two week travels as part of the 2017 International Leadership Seminar for State Officers, J.C. toured many farms around Johannesburg, Pretoria, and Cape Town. J.C.'s visit included a vegetable farm, a banana farm, a crocodile estate, boer goats, and a safari. J.C. also went to Robben Island and the Apartheid Museum to learn about South Africa's history. In the photograph, J.C. is standing at the top of Table Mountain overlooking Cape Town. Table Mountain is one of the 7 Natural Wonders of the World." J.C. , son of Mr. and Mrs. Russ (Shari Gittings) Campbell of rural Little York (Bald Bluff Township) is also the nephew of the Darrell Gittings, the West Central High School FFA Advisor, Biggsville. -When you go on a trip, take "The Quill" along, and have your picture taken with it, and send it to us. Let's see where all "The Quill" can travel.